Address: 610022, Kharkiv, Nauky Ave., 4. Igor Volodymyrovych Zavgorodnii — doctor of medical sciences, professor. 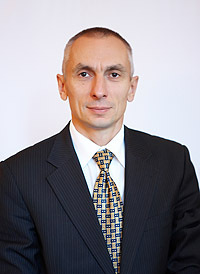 Acting Head of the Department - candidate of medical sciences, associate professor Sidorenko M.O. Lecturers in charge of: educational and methodical work – assistant Lalymenko O.S. ; scientific work – associate professor Filatova N.M.; educational work – senior teacher Chekhovskaya I. M.
Candidates of Medical Sciences, associate professors: Pertsev D.P., Sidorenko M.O., Filatova N.M., Korobchanskiy P.O. Senior laboratory assistant with higher medical education: Romayeva O.M. Laboratory assistant with medical education: Ryzhkova V.O. Laboratory assistant without medical education: Sushik A.V. The department trains students who study in specialty 7.110101 – «General Medicine», 7.110104 – «Pediatrics» and 7.110106 – «Dentistry». Since 2018-2019 academic year, training in specialty 7.110105 – «Preventive Medicine» is not provided. Study of the peculiarities of toxicodynamics and toxicokinetics of chemical compounds in mixed action with reduced temperature. Determination of adaptation mechanisms to the mixed action of chemical and physical environmental factors. Establishing early criteria for the diagnosis of burnout in workers of socially significant occupations. Prevention of burnout syndrome in military personnel of logistics units. During 2014-2018 academic years, 5 research and scientific works were carried out at the department. Employees took part in 141 scientific forums, among them: 13- in the countries of the Commonwealth of Independent States and 7 in foreign countries, including in international congresses: Psychosomatic medicine - 2015: Х international congress - St. Petersburg. ; 55. JAHRESTAGUNG DER DEUTSCHEN GESELLSCHAFT FÜR Arbeitsmedizin und Umweltmedizin e.V. in Munich; MU-Varna International Partnerships Forum International Partnerships for Youth-Students` life and Erasmus+, Varna and DGAUM – 58. Wissenschaftliche Jahrestagung. The following works are published: 1 monograph, 1 textbook and 2 manuals, 4 informational letters, 62 articles in medical journals, 31 - in professional journals, 18 articles in collections of scientific works, 2 articles in journals of Scopus database, 162 abstracts. The staff of the department worked out 1 patent of Ukraine for invention and 3 useful model patents. The department has 35 acts of implementation on the basis of research results. The members of the department were official opponents for 10 candidate and 2 doctoral theses; 2 doctoral and 17 candidate theses have been reviewed; 18 comments on the author's abstract have been made. The head of the department professor I.V. Zavgorodnii is a member of Specialized Academic Council. The work of the department is carried out on the basis of creative cooperation with Institute of Labor Medicine of the Academy of Medical Sciences of Ukraine (Kyiv); Department of internal and occupational diseases of KhNMU; Department of Labor Medicine, Faculty of Medicine, Otto von Guericke Magdeburg University (FRG); Regional Children's Clinical Hospital No. 1; Academy of Internal Troops of the Ministry of Internal Affairs of Ukraine; Clinical Hospital "Regional Clinical Hospital - Center for Emergency Services and Medicine of Catastrophes"; Kharkiv V. N. Karazin National University. The Department of General Hygiene and Ecology No. 2 was founded in 1997 on the basis of departments of hygiene of nutrition, pediatric hygiene, community hygiene and occupational hygiene, which existed since 1933. Until July 2005, the department was headed by the doctor of medical sciences, professor Krivonosov M.V., and from 2005 to 2007 - the candidate of medical sciences, professor Kratenko I.S. At the beginning of 2007-2008 academic year, the department was united with the Department of General Hygiene and Ecology No. 1 under the name "Department of Hygiene and Ecology" (the head of the department was doctor of medical sciences, professor Korobchanskiy V.O.). In May 2009, the Academic Council of the University made a decision to separate the department, and the Department of Hygiene and Ecology No. 2 was formed in September 2009, which can be considered the successor of the department organized in 1997. Its director became I.V. Zavgorodnii - professor, doctor of medical sciences, member of the Board of the Society of Toxicologists of Ukraine, the chairman of KhNMU Expert Commission. Today, the department remains the leading one on educational methodological and scientific provision for training of highly qualified specialists in the field of general eco-hygienic education of doctors.